"The plan seeks to convert the CTP of Osa, Guaycará de Golfito, Sabalito de Coto Brus and Platanares de Pérez Zeledón into demonstration cases where their integrated production systems are an example of profitability and sustainability," said Minor Quirós, pilot coordinator by the MAG, who also commented that this plan is based on a cooperation agreement signed between the MAG and the MEP to develop joint programs in food and nutrition security. 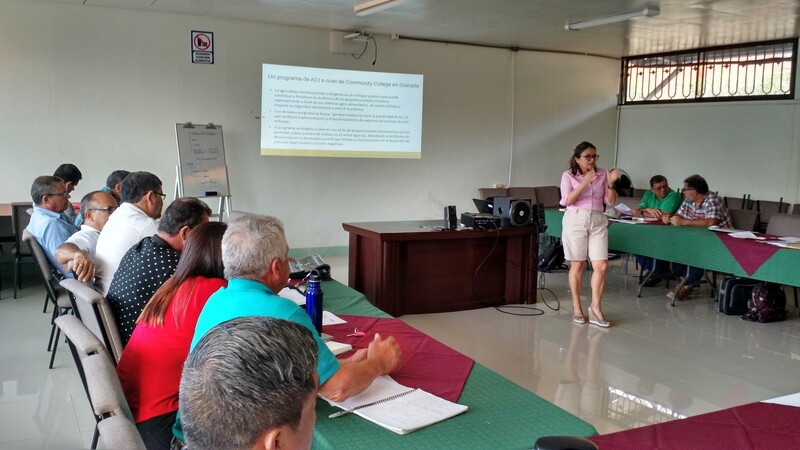 The workshop brought together a total of 25 people and CATIE participated as lecturers Leida Mercado, leader of the Research Program in Development, Economics and Environment (EfD-CA), and Rolando Cerda, researcher of the Agriculture, Livestock and Agroforestry Program (PRAGA). Also participating was Kaue De Sousa, researcher of Bioversity International, partner institution of CATIE. "During the workshop, the professors, directors and extensionists learned about the definition and advantages of the CSA approach and how it could be incorporated into the curriculum of the CTP’s. That's why we talked about the importance of the approach for schools, the successful experiences of CSA in Costa Rica and the world and the tools or technical instruments used in the CSA and its potential application in the region, "explained Mercado. According to Quirós, the workshop allowed to provide a broader and more comprehensive perspective to the participants on the existence of tools and practical tools to face the adverse effects of climate change in the agricultural sector and possibilities to integrate this knowledge into the CTP curriculum to graduate more competitive entrepreneurs. "The Brunca Region is being affected by the extreme effects of climate change, so it is strategic to train those in the CTP who will be the generational change in agriculture, with a high awareness of the subject and innovative knowledge," Quirós added. Mercado commented that currently incorporating the issue of climate change into the curriculum of educational institutions is essential and that there are tools that would make it more attractive and innovative for young people in rural areas. "Many young people do not feel very interested in staying in the countryside, they do not believe that agriculture can be interesting or well remunerated. However, the CSA approach would allow them to know a series of tools of information and communication technologies applied to agriculture, "said Mercado. In addition, Mercado explained that for CATIE it is of great importance to be taken into account in this initiative and thus be able to influence and try to generate a change in the generational dynamic that is taking place in the field. Finally, Quirós said that if the issue of climate change and CSA were included in these TCCs, CATIE would serve as an advisor in the preparation of contents for the collegiate curriculum and in the training of teachers.